So I did something this past weekend that I normally don’t do: I went on a nature walk. I normally don’t do that sort of thing because I–like every member of my generation–am addicted to the Internet, and while I can access it on my smartphone, it’s pretty difficult to open fifteen different tabs on the Android browser. There’s also the horrible Tennessee summertime heat and humidity that make going down the street for a tea a trial. Seriously, it’s close to Houston in terms of ungodliness. The heat index yesterday, for example, was 115 in Houston. It was 105 in Nashville. That’s insane. That’s actually–and I’m serious–enough heat and humidity for a person to boil an egg on the street and sweat enough to not have to go to a sauna. Ever. You will never have to go to a sauna because all of the sweat you will ever have in your life will drip out of you in the short time you’re outside. And then there are the bugs. I’ve heard that deeper in the South, the bugs are worse, but considering the size and amount of bugs in Tennessee, I have no desire to go south of Nashville. I’ve seen mosquitoes so big you’ll think you’re stuck in the Jurassic period. I’ve seen mosquito hawks–you know, those big fuckers that get stuck in your house and keep bumping into the ceiling because they can’t do anything else–the size of helicopters. But those aren’t the bugs I want to talk about today. I want to talk about the supreme assholes in the insect kingdom (family? ): Chiggers. For those of you not aware of these little bastards, chiggers (pictured above) are little red guys in the mite family. 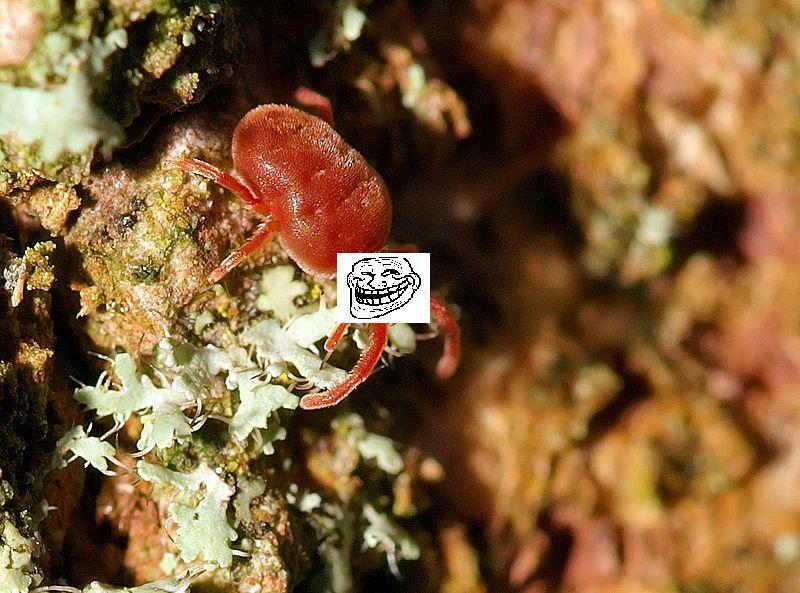 Personally, I view them as tiny trolls, lurking everywhere you can imagine, just waiting to ruin your day. How I like to think of them. They live in anywhere with grass. Creek beds, woods, hills with grass, lawns, golf courses, mountains–you get the picture. And, like all of their ilk, they’re very good at existing. They’re incredibly tiny, but their bite is infuriating. If you haven’t experienced a chigger bite, think a mosquito bite, but much smaller, focused, and about ten times as itchy. 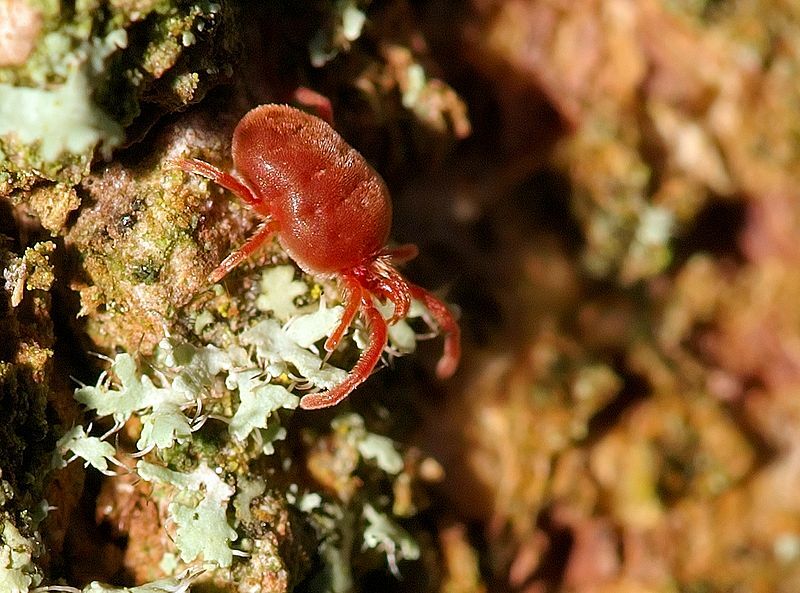 Moreover, chiggers don’t dine on your blood and leave; they bite and then migrate elsewhere on your body and stay there for however long it takes for you to just say, “screw it,” and skin yourself alive. My summer has been chiggertastic so far. I first ran into them at the beginning of the season when I had to chase my over-excited Augi into a creek bed. That batch stayed on me for a month. Then I thought I was done. I no longer itched at night; the red welts that popped up every day or two had stopped appearing; and the number of curses I said a day plummeted. My life–unexciting as it had been–was back to normal. Cue a friend this past weekend. He called asking if I wanted to go wander around an old camp that had been shut down for around twelve years. Lacking anything to do but edit my book for Amazon (which I’m terrified of doing, because it’s not so much editing as entirely rewriting), I said sure and, an hour or so later, he and I were on the way to a place near a small town called Joelton, Tennessee. That precipitated the camp being closed, and, after that, the land overgrowing to the point where nature took over all of the old camp buildings. The craft house was now a den of wasps and owls; the old cafeteria was taken over by ivy and weeds, sealing in a bunch of tractor equipment that had been left inside. So as the two of us walked around–one a tall dude who looked like he was going on safari, the other (me) in khaki shorts and a quickly sweat-soaked t-shirt, both being run around in circles by a hyper brown Standard Poodle–he pointed out where everything had been when he was a kid. I enjoyed myself, but spent most of the time looking in the grass for snakes. After a few hours of creek walking (I went barefoot–another point where I was scared shitless by the prospect of slipping on a rock and bashing my head open), we went back to his truck and proceeded to remove ticks. He counted 24 on his legs and arms. I counted 18 and counted myself lucky. I was wrong. In addition to the ticks were the chiggers. The ungodly little fucks who proceeded to bite the hell out of my legs and feet, and make their way up to my arms during the night. The next morning, I woke up with around 27 chigger bites on my body and in excruciating pain. I dove into the medication cabinet and started burning through the anti-histamines. That was Monday. It is now Thursday and, after two bites growing, ah, disgusting, I’m on anti-biotics and have gone through three bottles of anti-histamines. So. Chiggers? You’re assholes. You’re the terrible roommates of the animal kingdom, I award you no points, and may God have mercy on your souls.